AUGUSTA, Maine — Gov. Paul LePage swore, pounded a table and stormed out of a meeting with three independent House members last week, according to the lawmakers. The trio said they hoped to talk to the governor about alternate approaches to balancing the state budget. Instead, the lawmakers said the governor called them “idiots” and again railed against Maine’s public schools. Rep. Joe Brooks of Winterport, a former Democrat, set up the meeting with LePage weeks after the governor refused to meet with the Legislature’s Democratic leaders. Last month, LePage called on House Speaker Mark Eves and Senate President Justin Alfond to urge their party to stop dispatching a cameraman to film him at public events, but Eves and Alfond didn’t heed the call. The three still have not met. Rep. Jeff Evangelos of Friendship and Rep. Ben Chipman of Portland also attended the meeting. The trio are the only members of the 151-member Maine House who aren’t caucusing with either the Republican or Democratic parties. One other independent, Rep. James Campbell of Newfield, is caucusing with House Democrats. Chipman said the unenrolled members went into their meeting with LePage intent on discussing the governor’s post-Christmas $35.5 million spending curtailment order and his recently unveiled two-year budget proposal. 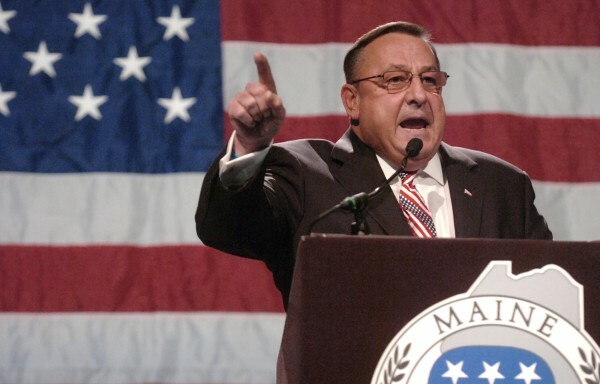 A LePage spokeswoman didn’t respond to a reporter’s requests for comment Monday. Evangelos said he suggested repealing a package of income tax cuts passed in LePage’s first budget that took effect at the start of the month, a move that LePage promised to veto. The tax cuts remove about 70,000 low-income residents from the state income tax rolls and lower the top tax rate to 7.95 percent from 8.5 percent. The state will forgo about $342 million in individual income tax collections during the two years covered by the next budget as a result, LePage’s finance commissioner, Sawin Millett, has said. Evangelos, Brooks and Chipman said they remained calm throughout the meeting and didn’t raise their voices in response to LePage. During the 35-minute meeting among the four men, Chipman suggested raising the state’s lodging tax — which is 7 percent, among the lowest levels in New England — to generate additional revenue. Chipman has filed legislation that would increase the lodging tax and direct the added revenue back to cities and towns and to the state’s tourism marketing budget. During the meeting, the lawmakers said, LePage also voiced criticisms that Maine isn’t business-friendly and that businesses don’t want to locate in Maine because of the quality of the state’s workforce; that Maine schools aren’t preparing students for college-level work; and that Maine’s public schools employ too many superintendents. Too many of those superintendents, he added, are double dippers: They’re collecting retirement system pensions while earning a salary for working. Evangelos also said he pointed out to LePage that Millett is collecting pensions from past state government and legislative service while working in LePage’s administration. Brooks came out of the meeting with LePage without much hope that the Republican governor and the new Democratic majorities in the House and Senate will be able to work together in the coming months.